Well, it only took a year for me to finally get to redesign the YackTrack interface. I am sure you are saying “it is about time!”, and I would agree with you. Hopefully, you like the new look as I was trying to make the site more usable instead of the “data dump” layout that it had previously. So, on the search pages, you will see new groupings by service for the comments. In some cases, the comments (or likes) are coming from FriendFeed, in other cases they come from the source service. As you can see there are some other changes on that page (you can click the image to see it full size). First, you will see that above the search results, there are two pieces of information, what you searched for and something called “Yackability”. Yackability is YackTrack’s attempt to measure how much conversation is occurring for a particular search. It is a measure of the number of votes and comments on each service that YackTrack supports. For each service, the number of comments and votes or likes are included as well. This number may not equal what you see as YackTrack searches only return the most recent search results. However, all votes and comments are not created equal. Mostly, the votes required to make a difference is highly dependent on the amount of traffic a site gets. Obviously, I will not go into detail as I do not want to give away the “secret sauce”. Also, the Yackability index will be updating for a while today, so do not get upset when you see your blog post with a Yackability of zero. The dashboard has changed as well in order to keep a consistent look on the site. Again you can see the collapsible sections and the content has been reorganized. The Queries section only holds the Chatter queries and those blog posts that are not linked directly to a blog that you have registered. The Blogs section holds your blogs and the posts grouped by month. Obviously, the table for high volume blogs will still be large, but this is a big improvement from the old version of the dashboard. 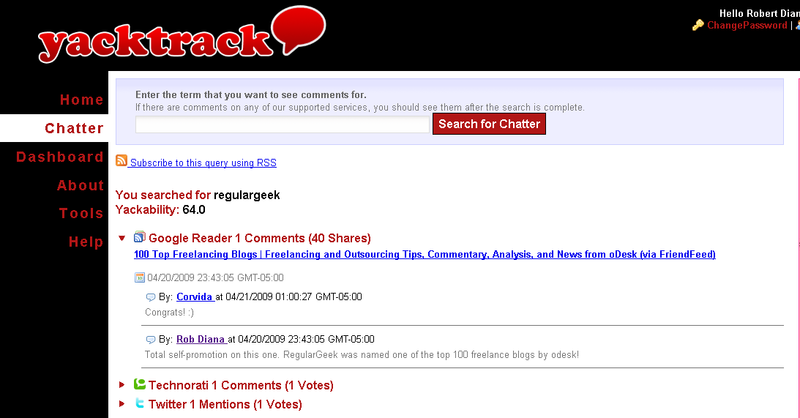 Again, the Yackability measure is included for each Chatter query and each blog post. As usual, with any update and maintenance, please let me know if you see any problems. You can always email us at support at yacktrack.com. I will be actively making minor changes and fixes over the next two weeks to ensure it is stable. The next major update will likely include better Twitter integration and some performance improvements. As YackTrack has grown, the database needs to be continuously maintained. Some of this results in standard database maintenance, while others may require larger changes especially when dealing with Twitter. There will also be an update to the API at some point in order to give access to the votes, comments and Yackability index. Previous Post Is Usable Discovery The Holy Grail?